Phoenix played without leading-scorer Devin Booker, who suffered a right rib contusion in the Suns’ loss Sunday at Houston. X-rays on the Phoenix guard before Monday night’s game were negative. In a game where both teams seem destined for lottery picks in the draft, it was the potent second-quarter for Memphis that made the difference after a first filled with turnovers and inconsistent offense. Memphis’ 17 field goals included the Grizzles converting all three of their shots beyond the arc. Jarell Martin made all three of his shots in the frame, and Evans was perfect on his four attempts. Memphis had 12 of its 29 assists in the second. Suns: Troy Daniels converted a 3-pointer with 9:15 left in the first quarter, the 1,109th consecutive game with a 3-pointer. That surpassed the Dallas Mavericks record of 1,108 between 1999-2012 for the longest in NBA history. 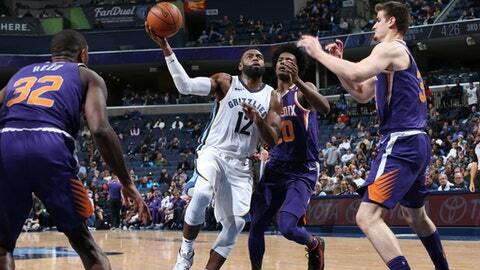 … Won the previous two over the Grizzlies this season – both games by two points. …Injuries resulted in Isaiah Canaan starting his first game of the season. … Tyler Ulis and Jared Dudley both scored 13 points, Ulis handing out seven assists. Grizzlies: It was Gasol’s 33rd birthday. He recorded his 20th double-double of the season. .Evans led the team in scoring for the 20th time this season. He has scored at least 25 points in 14 games.